The injured former Nigerian striker Obafemi Martins has stated that he is overwhelmed with support received from his club Shanghai Shenhua after picking up an injury and was carried off the pitch during a 2-2 draw with Kashima Antlers in the Asian Champions League last week Tuesday. 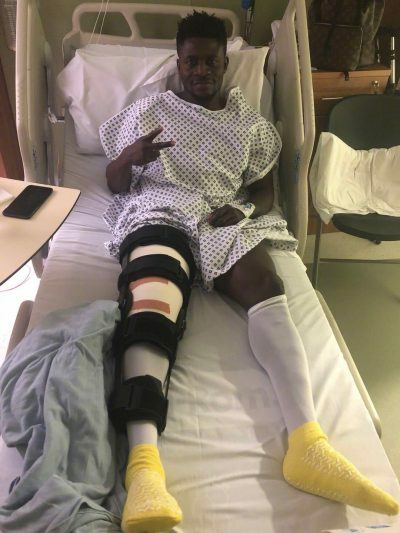 Martins has undergone a successful surgery on his ruptured quadriceps tendon in the United Kingdom and is impressed by the show of solidarity by his club. Obafemi Martins has taken time on social media to appreciate the support he has received from his club. He wrote on his Instagram account: “Thanks for the love see you guys soon one love keep the fighting spirit Shanghai Shenhua”. Obafemi Martins joined Shanghai Shenhua in February 2016 and has scored 19 league goals in 27 starts, Martins scored a hat-trick in his last league match for Shanghai Shenhua just before he picked up the injury, Shanghai won 4-2 against Hebei China Fortune. Martins has previously played for Inter Milan, Newcastle United, Birmingham City, Wolfsburg, Levante and MLS side Seattle Sounders. Obafemi Martins will be out of action for at least six or seven months as he starts the recovery process after a successful surgery.